Chinese New Year, often referred to as the Lunar New Year, begins today! It’s the Year of the Dragon, which is said to be an especially lucky year in the Chinese Zodiac. The 15 day festival ends with the Lantern Festival (February 6th this year), where families come together, eat yuanxiao (a glutinous rice ball), hang colorful lanterns and solve riddles on them. On Chinese New Year’s Eve, a poor man who works for the richest businessman in Beijing sends his son to market to trade their last few eggs for a bag of rice, but instead he brings home an empty – but magic – wok that changes their fortunes forever. 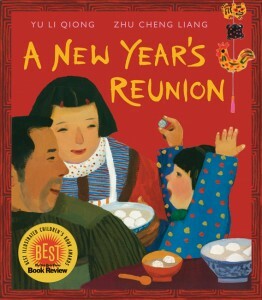 With the help of his popular Uncle Chester, a young Chinese American boy tries hard to fulfill a promise to have firecrackers for everyone on the Chinese New Year in 1954. Little Maomao’s father works in faraway places and comes home just once a year, for Chinese New Year. At first Maomao barely recognizes him, but before long the family is happily making sticky rice balls, listening to firecrackers, and watching the dragon dance in the streets below. This book explores the history, customs, and symbols of Chinese New Year. Learn how Chinese New Year has changed over time and how it is celebrated around the world. This beautifully illustrated history is also filled with interesting and unusual facts about the holiday such as what foods can be found on the Tray of Togetherness and why the color red is important. 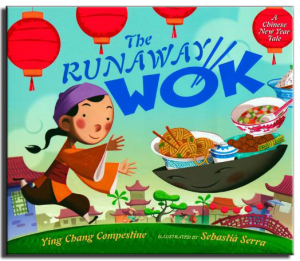 In Chinese and English Nursery Rhymes, an innovative collection of favorite rhymes are put in pairs—one from China and the next in English—to show how the things that kids love are the same, no matter where in the world they live. Whether your native language is English or Chinese, you can learn the rhymes along with your children. Just follow the words on the page, or play the CD and sing along! This entry was posted in Children and tagged children's books, holiday by Emily. Bookmark the permalink.